The advantages of having a lap desk are numerous. 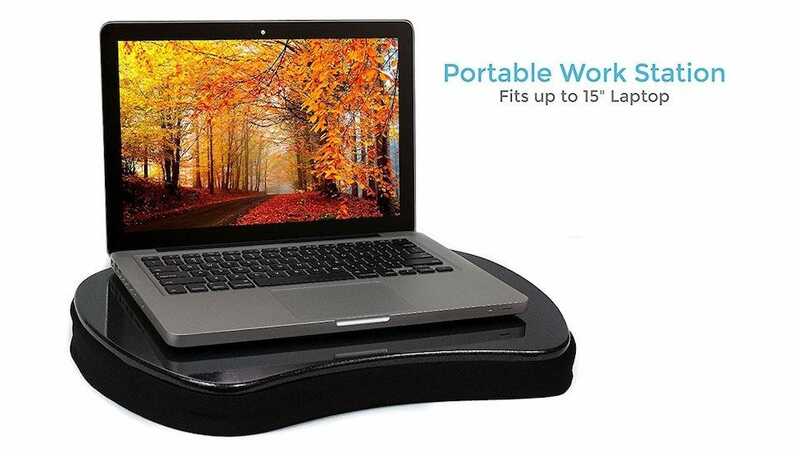 Notably, you don’t have to worry about your laptop overheating or your legs getting too warm from having the system resting on your legs for too long. Further, It’s often a far more comfortable way of working as your laptop is elevated and stable. There’s also the extra space that comes from using a lap desk, along with additional slots to store your phone or tablet. Here are some of our favorite options with their key features outlined. Available in two colors—Espresso Wood and Silver Carbon, seen here—the LapGear Home Office Lap Desk is both stylish and spacious. It has enough space for up to a 17 inch laptop, and its microbead dual-bolster pillows ensure it’s a comfy fit for your lap and legs, moulding snuggly to you. Even with the soft pillows forming to your legs, the channeled design help keep the bottom of the desk cool. It’s a chunky size, to be sure, on account of the built-in mouse pad and the phone cradle. 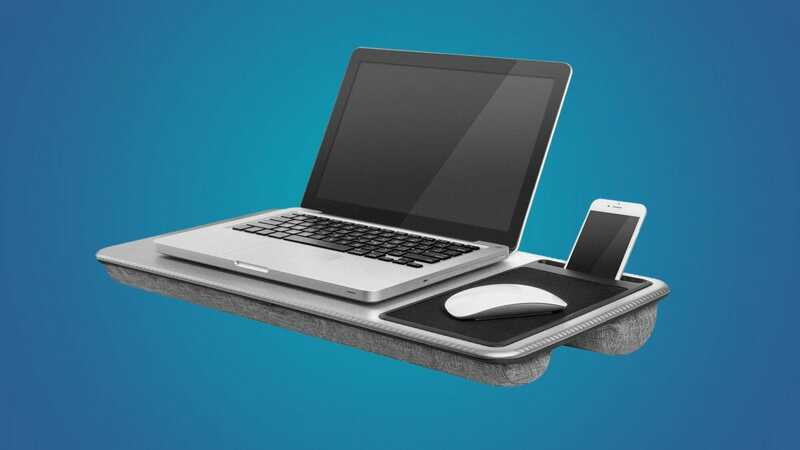 Those are great features if you’re using it in one place but this definitely isn’t the kind of lap desk that will pack well if you’re looking for something to take on a business trip. Vibrantly colored, the Honey-Can-Do Portable Laptop Lap Desk is squarely aimed at a more casual market than most lap desks. It’s lightweight and made from laminated MDF, so it’s easy to clean and maintain. Underneath the surface is a soft wedge-shaped cushion attached with velcro so it’s easy to remove if it needs laundering (or, you know, if you’ve got something against comfort). It’s not as professional looking as other lap desks here, but it’s great for portability. Lighter than most, it’ll work just as well in the car as it will on your bed. Unlike other options in our roundup, however, it’s got a particularly slick surface on account of the laminate. As final consideration, if you’re not picky about color choice the plain white variety is a few bucks less than the more vibrant options. 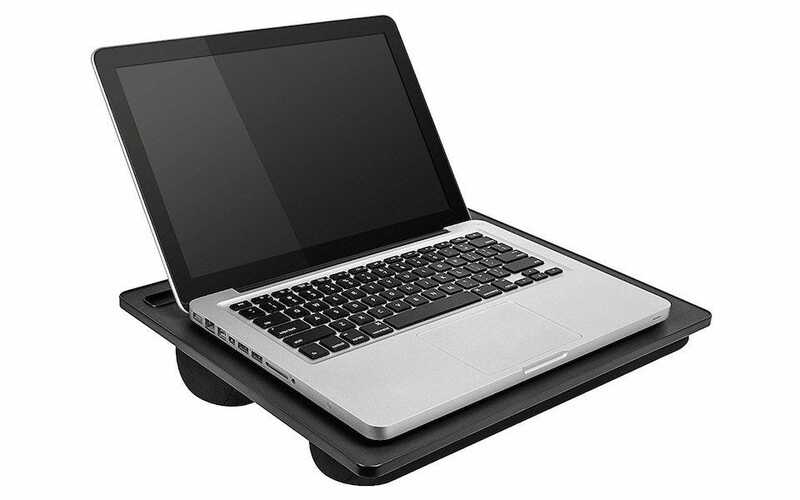 The Mind Reader Adjustable 8 Position Laptop Desk is a pretty ugly lap desk, if we’re being blunt, but it’s quite useful if you want a highly adjustable lap desk. As the name suggests, it’s adjustable to 8 different angles giving you plenty of different options for hands-free use and optimal viewing. 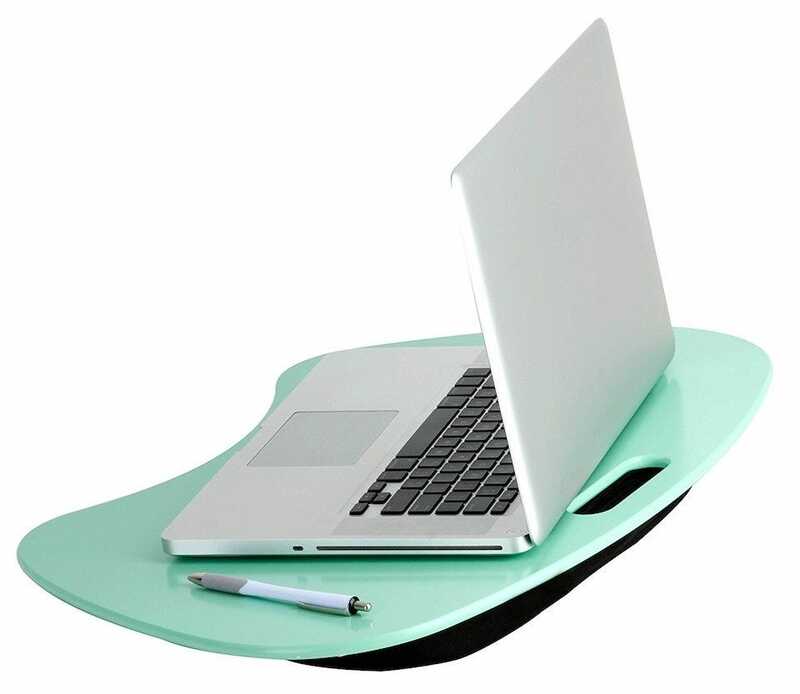 This is a lap desk that’s best suited for watching videos or reading a manuscript, rather than for working extensively on. With so many options for adjustments, you can tweak it according to how you’re sitting or laying, without missing out on seeing a thing. It offers a dual-bolster pillow too, which takes the edge off heat going to your legs, as well as provides a stable surface. There’s no slot for your phone though, and did we mention this isn’t a stylish solution? It really isn’t. 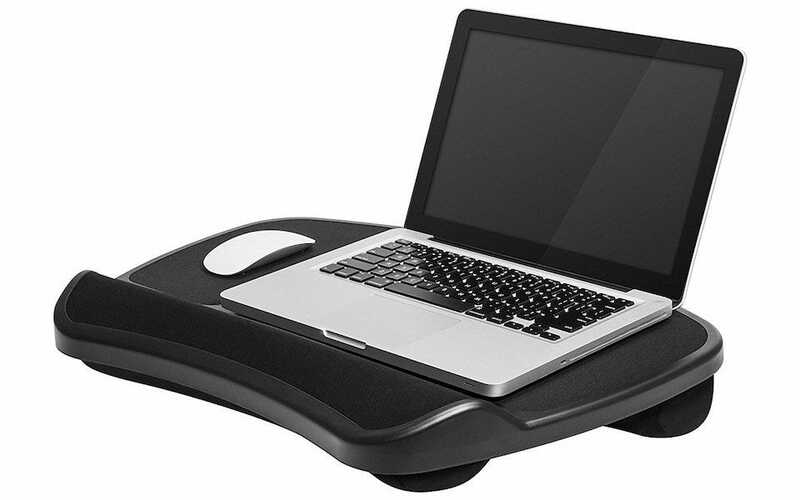 A budget priced alternative to the Lap Desk, the LapGear Student keeps things simple. It’s a comfortable surface on both sides, fitting up to a 15 inch laptop, but without any room for phones or peripherals. It still keeps you comfortable though, and there’s an airflow channel for reducing unwanted heat. Underneath the desk is a dual-bolster pillow that keeps your lap happy, while the top side is slightly textured so there’s no risk of your laptop sliding off. Keeping it so simple also makes it the perfect surface for reading or writing on too. It’s fairly no-frills but it’s perfect for budget conscious users. 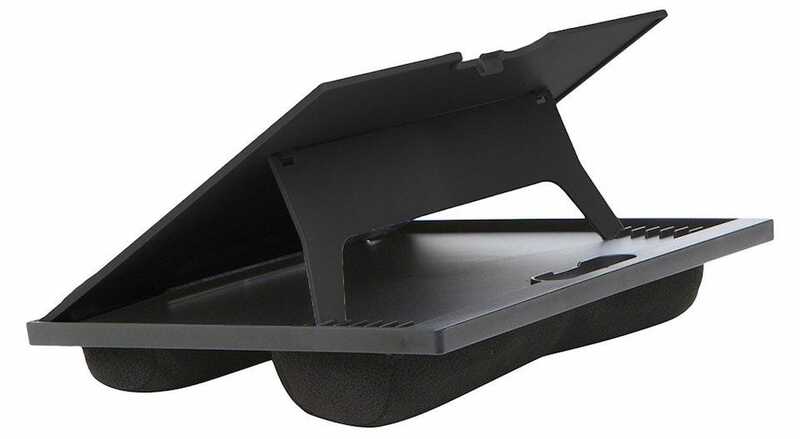 The AboveTEK Portable Laptop Lap Desk is a fairly typical lap desk, but it offers one crucial feature that makes it stand out amongst the rest—a retractable mouse pad tray. Appreciating you might not always want to use a mouse with your laptop, the tray goes inside the desk any time you’re not using it. And, it’s ambidextrous so left handed folk won’t feel like they’re missing out. Besides that, a textured rubber surface ensures a strong grip at all times, with a non-skid base. A thermal-resistive heat shield protects you from excessive warmth, although there’s no cushion underneath, nor is there a slot for your phone. However, it’s the right size for pretty much any laptop imaginable, and the retractable mouse pad keeps your work options flexible. Between the cushion-free design and the retractable pad, this is a perfect suitcase friendly option for business travelers. 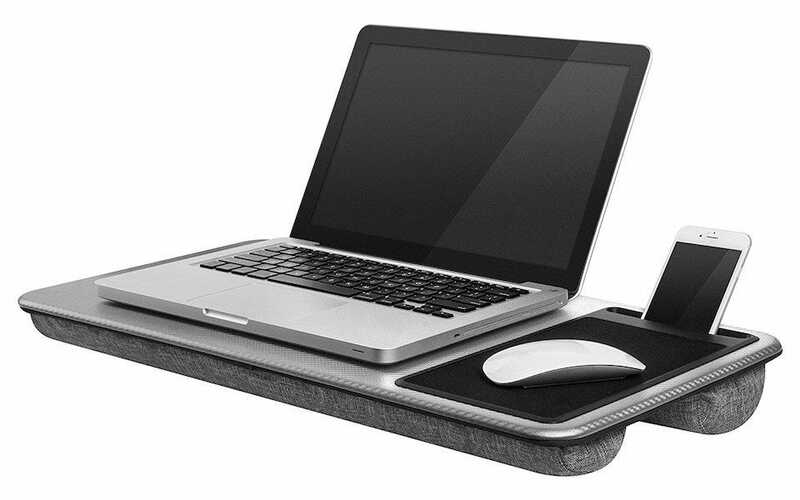 The Sofia + Sam Mini Memory Foam Lap Desk keeps things simple. 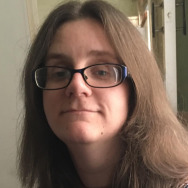 Its focus is on comfort, with a memory foam style cushion ensuring your legs and lap feel as comfortable as if you didn’t have a laptop resting on it. It’s a little smaller than others, so it won’t fit a laptop bigger than 15 inches, but that should suit most users. It might lack a slot for your phone or a place for a mouse, but it’s distinctly lightweight and easy to fit into your backpack or store at home. A fabric handle is conveniently hidden away for when you’re not carrying it around, and it’s ergonomically designed. Want the biggest lap desk you can find? The LapGear XL Laptop Lap Desk is it. The desk is a hefty size, providing plenty of room for a mouse pad on which side suits you. 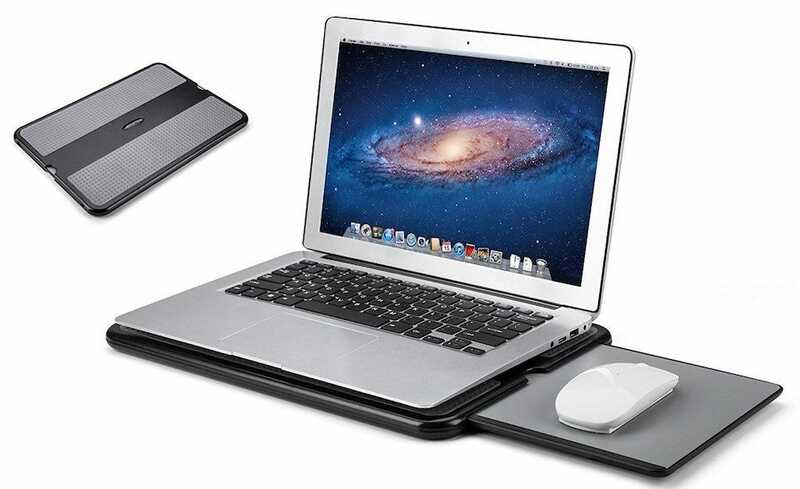 Alongside that is an ergonomic wrist pad which makes typing comfortable, while it also keeps your laptop from sliding. To further empathise how much space is available here, there are side storage pouches so you can store any useful accessories within the lap desk. There’s enough room for flash drives, a mouse, chargers, or mostly anything else you might want to carry with. In terms of options, it’s hard to fault the LapGear XL Laptop Lap Desk, but don’t expect it to be the most portable desk here. It works best as a home based desk replacement.